An opened and charged AED. This model is semi-automatic, due to the presence of a manual shock button. A diagram showing the chain of survival. In each of these two types of shockable cardiac arrhythmia, the heart is electrically active, but in a dysfunctional pattern that does not allow it to pump and circulate blood. In ventricular tachycardia, the heart beats too fast to effectively pump blood. Ultimately, ventricular tachycardia leads to ventricular fibrillation. In ventricular fibrillation, the electrical activity of the heart becomes chaotic, preventing the ventricle from effectively pumping blood. The fibrillation in the heart decreases over time, and will eventually reach asystole. AEDs, like all defibrillators, are not designed to shock asystole ('flat line' patterns) as this will not have a positive clinical outcome. The asystolic patient only has a chance of survival if, through a combination of CPR and cardiac stimulant drugs, one of the shockable rhythms can be established, which makes it imperative for CPR to be carried out prior to the arrival of a defibrillator. AEDs are designed to be used by laypersons who ideally should have received AED training. However, sixth-grade students have been reported to begin defibrillation within 90 seconds, as opposed to a trained operator beginning within 67 seconds. This is in contrast to more sophisticated manual and semi-automatic defibrillators used by health professionals, which can act as a pacemaker if the heart rate is too slow (bradycardia) and perform other functions which require a skilled operator able to read electrocardiograms. Bras with a metal underwire and piercings on the torso must be removed before using the AED on someone to avoid interference. American television show Mythbusters found evidence that use of a defibrillator on a woman wearing an underwire bra can lead to arcing or fire but only in unusual and unlikely circumstances. In a study analyzing the effects of having AEDs immediately present during Chicago's Heart Start program over a two-year period, of 22 individuals, 18 were in a cardiac arrhythmia which AEDs can treat. Of these 18, 11 survived. Of these 11 patients, 6 were treated by bystanders with absolutely no previous training in AED use. An AED at a railway station in Japan. Automated external defibrillators are generally either kept where health professionals and first responders can use them (health facilities and ambulances) as well as public access units which can be found in public places including corporate and government offices, shopping centres, restaurants, public transport, and any other location where people may congregate. In order to make them highly visible, public access AEDs are often brightly coloured and are mounted in protective cases near the entrance of a building. When these protective cases are opened or the defibrillator is removed, some will sound a buzzer to alert nearby staff to their removal, though this does not necessarily summon emergency services; trained AED operators should know to phone for an ambulance when sending for or using an AED. 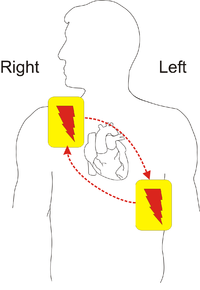 In September 2008, the International Liaison Committee on Resuscitation issued a 'universal AED sign' to be adopted throughout the world to indicate the presence of an AED, and this is shown on the right. A trend that is developing is the purchase of AEDs to be used in the home, particularly by those with known existing heart conditions. The number of devices in the community has grown as prices have fallen to affordable levels. There has been some concern among medical professionals that these home users do not necessarily have appropriate training, and many advocate the more widespread use of community responders, who can be appropriately trained and managed. Most manufacturers recommend checking the AED before every period of duty or on a regular basis for fixed units. Some units need to be switched on in order to perform a self check; other models have a self check system built in with a visible indicator. All manufacturers mark their electrode pads with an expiration date, and it is important to ensure that the pads are in date. This is usually marked on the outside of the pads. Some models are designed to make this date visible through a 'window', although others will require the opening of the case to find the date stamp. An AED is "automatic" because of the unit's ability to autonomously analyse the patient's condition. To assist this, the vast majority of units have spoken prompts, and some may also have visual displays to instruct the user. "External" refers to the fact that the operator applies the electrode pads to the bare chest of the victim (as opposed to internal defibrillators, which have electrodes surgically implanted inside the body of a patient). When turned on or opened, the AED will instruct the user to connect the electrodes (pads) to the patient. Once the pads are attached, everyone should avoid touching the patient so as to avoid false readings by the unit. The pads allow the AED to examine the electrical output from the heart and determine if the patient is in a shockable rhythm (either ventricular fibrillation or ventricular tachycardia). If the device determines that a shock is warranted, it will use the battery to charge its internal capacitor in preparation to deliver the shock. This system is not only safer (charging only when required), but also allows for a faster delivery of the electric current. When charged, the device instructs the user to ensure no one is touching the patient and then to press a button to deliver the shock; human intervention is usually required to deliver the shock to the patient in order to avoid the possibility of accidental injury to another person (which can result from a responder or bystander touching the patient at the time of the shock). Depending on the manufacturer and particular model, after the shock is delivered most devices will analyze the patient and either instruct CPR to be performed, or prepare to administer another shock. Many AED units have an 'event memory' which store the ECG of the patient along with details of the time the unit was activated and the number and strength of any shocks delivered. Some units also have voice recording abilities to monitor the actions taken by the personnel in order to ascertain if these had any impact on the survival outcome. All this recorded data can be either downloaded to a computer or printed out so that the providing organisation or responsible body is able to see the effectiveness of both CPR and defibrillation. Some AED units even provide feedback on the quality of the compressions provided by the rescuer. The first commercially available AEDs were all of a monophasic type, which gave a high-energy shock, up to 360 to 400 joules depending on the model. This caused increased cardiac injury and in some cases second and third-degree burns around the shock pad sites. Newer AEDs (manufactured after late 2003) have tended to utilise biphasic algorithms which give two sequential lower-energy shocks of 120–200 joules, with each shock moving in an opposite polarity between the pads. This lower-energy waveform has proven more effective in clinical tests, as well as offering a reduced rate of complications and reduced recovery time. A standard logo is clearly advertised. The location is indicated in OpenStreetMap by the emergency=defibrillator tag. Unlike regular defibrillators, an automated external defibrillator requires minimal training to use. It automatically diagnoses the heart rhythm and determines if a shock is needed. Automatic models will administer the shock without the user's command. Semi-automatic models will tell the user that a shock is needed, but the user must tell the machine to do so, usually by pressing a button. In most circumstances, the user cannot override a "no shock" advisory by an AED. Some AEDs may be used on children – those under 55 lbs (25 kg) in weight or under age 8. If a particular model of AED is approved for pediatric use, all that is required is the use of more appropriate pads. All AEDs approved for use in the United States use an electronic voice to prompt users through each step. Because the user of an AED may be hearing impaired, many AEDs now include visual prompts as well. Most units are designed for use by non-medical operators. Their ease of use has given rise to the notion of public access defibrillation (PAD), which experts agree has the potential to be the single greatest advance in the treatment of out-of-hospital cardiac arrest since the invention of CPR. Some advances include a CPR feedback device by Zoll and Cardiac Science, non-polarized pads (they can be placed in either location) by Cardiac Science, a status indicator most AEDS, and simple voice and text prompts with an adjustable skill level, on most AEDs. Automated external defibrillators are now easy enough to use that most states in the United States include the "good faith" use of an AED by any person under Good Samaritan laws. "Good faith" protection under a Good Samaritan law means that a volunteer responder (not acting as a part of one's occupation) cannot be held civilly liable for the harm or death of a victim by providing improper or inadequate care, given that the harm or death was not intentional and the responder was acting within the limits of their training and in good faith. In the United States, Good Samaritan laws provide some protection for the use of AEDs by trained and untrained responders. AEDs create little liability if used correctly; NREMT-B and many state Emergency Medical Technician (EMT) training and many CPR classes incorporate or offer AED education as a part of their program. In addition to Good Samaritan laws, Ontario, Canada also has the "Chase McEachern Act (Heart Defibrillator Civil Liability), 2007 (Bill 171 – Subsection N)", passed in June, 2007, which protects individuals from liability for damages that may occur from their use of an AED to save someone's life at the immediate scene of an emergency unless damages are caused by gross negligence. In the United Kingdom there is concern that poor maintenance may make public defibrillators unreliable. The Henley Standard reported on 21 July 2017 that more than half the defibrillators in Henley-on-Thames and the surrounding area were at risk of failing, either because of low battery power or because adhesive pads had deteriorated. The first use of an external defibrillator on a human was in 1947 by Claude Beck. The portable version of the defibrillator was invented in the mid-1960s by Frank Pantridge in Belfast, Northern Ireland, a pioneer in emergency medical treatment. In a study published in 2017, researchers in Poland selected the main entrances of buildings which had AEDs, although the researchers themselves did not know the exact locations of the devices. In drills of pretend heart attack, the average time to bring the AED to the patient was 96 seconds, with a time that ranged from 52 to 144 seconds. This met the three minute goal. In some cases, the use of the AED required the continuous presence of building personnel. Future improvements include more obvious signage and public-access AEDs which do not require a staff member of the building to either retrieve or use the device. ^ a b Kerber, Richard E; Becker, Lance B; Bourland, Joseph D; Cummins, Richard O; Hallstrom, Alfred P; Michos, Mary B; Nichol, Graham; Ornato, Joseph P; Thies, William H; White, Roger D; Zuckerman, Bram D (March 18, 1997). "Automatic External Defibrillators for Public Access Defibrillation". Circulation. American Heart Association. 95 (1677–1682): 1677–82. doi:10.1161/01.cir.95.6.1677. PMID 9118556. Archived from the original on 8 June 2007. Retrieved 2007-06-28. ^ "CPR Adult Courses". American Red Cross. Archived from the original on 3 July 2007. Retrieved 2007-06-28. ^ "Cardiopulmonary Resuscitation (CPR) Statistics". American Red Cross. Archived from the original on 19 November 2008. Retrieved 2008-10-27. ^ American Red Cross. CPR/AED for the Professional Rescuer (participant's manual). Yardley, PA: StayWell, 2006. p. 63. ^ U.S. Department of Labor Occupational Safety and Health Administration (2001). "Cardiac arrest a automated external defibrillators (AEDs)". OSHA Publication No. TIB 01-12-17. ^ "How To Use an Automated External Defibrillator". National Heart Lung and Blood Institute. Archived from the original on 23 June 2011. Retrieved 24 May 2011. ^ de Vries, Lloyd (2006-03-22). "Breathing Easier". CBS News. Archived from the original on 29 April 2009. Retrieved 2009-04-22. We got a short lesson in using an AED, which is an Automated External Defibrillator. We had the thrill of yelling, "Clear!" Unfortunately this also brought on a little anxiety when Sean mentioned if the patient were a woman with a metal underwire in her bra or with metal piercings on her torso, we'd have to remove them. ^ "Underwire Bra Can Mess with Defibrillator". 2012-04-11. ^ Caffrey SL, Willoughby PJ, Pepe PE, Becker LB (October 2002). "Public use of automated external defibrillators". N. Engl. J. Med. 347 (16): 1242–47. doi:10.1056/NEJMoa020932. PMID 12393821. ^ "Look for me in airports/Hockey arenas". 2010-02-10. ^ "ILCOR presents a universal AED sign". European Resuscitation Council. ^ "Heartstart Home Defibrillator". Philips Electronics. Archived from the original on 13 June 2007. Retrieved 2007-06-15. ^ Barnaby, Barnaby J (2005-05-03). "Do It Yourself: The Home Heart Defibrillator". New York Times. Retrieved 2007-06-15. ^ CPR/AED for the Professional Rescuer, supra, p. 65 ("[a] safety surgical razor should be included in the AED kit.") The other items not directly mentioned in this text but are used in AED preparation, such as the gloves (used throughout patron assessment) and the towel, as the chest should be dried prior to AED pad attachment (id, at p. 64). ^ Northwest Health; Safety Inc. "AED Universe: A Northwest Health and Safety Company". Retrieved 21 January 2013. ^ "ZOLL® AED Plus® Package w/Voice Recording". AED Superstore. Retrieved 2016-05-12. ^ "AED Plus Biphasic Waveform". ZOLL Medical Corporation. Retrieved 2008-10-27. ^ Laws on Cardiac Arrest and Defibrillators, 2013 update. National Conference of State Legislatures. Retrieved on 2013-03-18. ^ "The Shocking Truth About Defibrillators". IEEE Spectrum, March 2012. Retrieved 2012-07-28. 2012-02-27. ^ "FDA takes steps to improve reliability of automated external defibrillators". FDA News Release, January 2015. Retrieved 2017-07-15. ^ "Effective Date of Requirement for Premarket Approval for Automated External Defibrillator Systems; Republication". Federal Register, February 3, 2015. Retrieved 2017-07-15. 2015-02-03. ^ White, David (21 July 2017). "Life-savers out of date". Henley Standard. ^ Shurlock, B (18 December 2007). "Pioneers in cardiology: Frank Pantridge, CBE, MC, MD, FRCP, FACC" (PDF). Circulation. 116 (25): f145–48. doi:10.1161/CIRCULATIONAHA.107.187677. PMID 18086933. ^ Evans, Alun (April 2, 2005). "Frank Pantridge". BMJ. 330 (7494): 793. doi:10.1136/bmj.330.7494.793. PMC 555899. Wikimedia Commons has media related to AED.